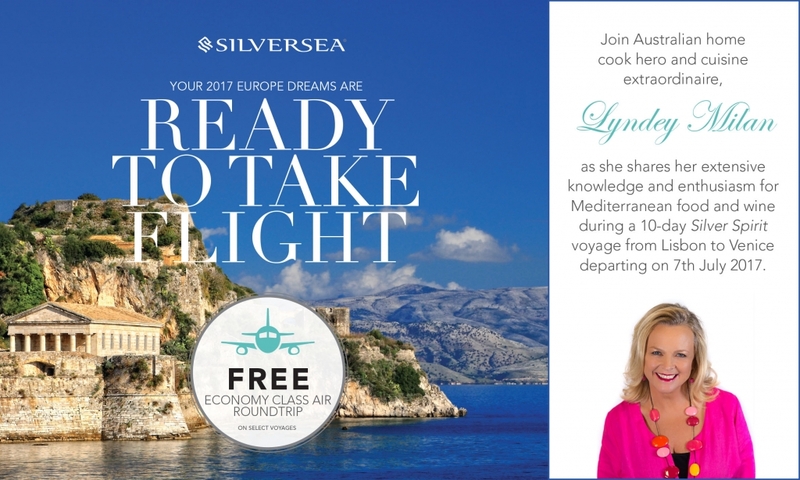 Come sail aboard Silver Spirit with Silversea’s latest Enrichment as I guest Lecturer. Silversea guests will depart Lisbon, Portugal on 07 July 2017, on an exclusive 10-day voyage through Spain, Italy, Malta and Greece before culminating in Venice, Italy. Guests can experience a behind the scenes glimpse into my culinary expertise, as I shares extensive, knowledge and passion for Mediterranean food and wine. I’m thrilled to be making my first voyage with Silversea aboard Silver Spirit. Not only do I love cruising, especially not having to pack and unpack, but this cruise goes to some amazing destinations. We are visiting five countries with eight landings and two days at sea. This gives me the unique opportunity to demystify all the cuisines with cooking demonstrations featuring the cuisines of Spain, Sicily and Greece. There will be wine matches and easy recipes to recreate at home. I’m looking forward to working with the chef to recreate one of my recipes in the restaurant – but you’ll have to book to see which one it is! For each new booking made on this voyage prior to 30 June 2017, guests will receive a personally signed cookbook and DVD set from the “Lyndey & Blair’s Taste of Greece series.” Another highlight of this voyage is visiting the modern-day island of Corfu, Greece, filled with sophisticated charm, history and natural beauty. Here guests can spend time sightseeing some of the island’s most fascinating places, including: Achilleion Palace, the picturesque beach of Paleokastritsa, Old Town of Corfu, a UNESCO World Heritage Site, and Corfu’s highest mountain, Mount Pantokrator. Guests will also have the opportunity to explore some of the most beautiful destinations in the Mediterranean. Silver Spirit visits Portimão, Cadiz, Malaga, Cartagena, Tapianic, Sicily and Valetta, Malta, where guests can be amazed by serene landscapes, cliff-perched villages and breathtaking ancient ruins. For full details please visit Silversea. Or email me by clicking here or ring my office on (02) 8437 7500.